The Juan Lopez Petit Coronas is a rich and smooth medium Habanos of Petit Corona format, 5.1” (129mm) long, of 42 ring gauge, and comes in a 25 cigars box. It’s neither the most famous Petit Coronas from Habanos SA for sure, nor the prettiest looking. However, it is a very affordable stogie that is very pleasant to smoke. It is a smoke that offers typical Cuban flavors, wood, tobacco, strong leather, earthy tones, coupled with lots of soft spices and notes of cocoa, honey, nuts and hay. Thanks to its amazing construction, the draw is perfect all along; the burn line is sharp and generates a good amount of smoke. Great first smoke for any beginner, but will also please experienced smokers. Ageing recommended of 2 to 3 years. 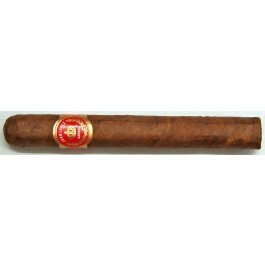 The Juan Lopez Petit Coronas is a very good option for a go-to cigar and when the time is of the essence. • Quite complex cigar with creamy coffee, notes of wood and cocoa, nuts, honey mixed on top of tobacco flavors. • This cigar can be a bit young, give it some time to age, it will just become even better. This might be the lesser known among Petit Coronas, but give it a try. It will surprise you. The cigar is looking somewhat rough, the wrapper has some bumps, but the construction is great nevertheless. The wrapper is perfect except for few small veins, the color is light brown, a thin sheen of oil on it and the cap is very well applied. The quality of rolling is great, the cigar feels good between the fingers and the cigar is slight box pressed. The wrapper smells of hay with some hints of cocoa, typical of so many Habanos. Once cut, the draw is great. It lights up very easily, and instantly some spices coats the tongue, but not strong spice, not the one that tingles the lips, there is also some sweet notes. The burn is awesome from the get-go and creates a very solid ash that seems to be holding up. A nice smoke is rising from the foot. The first third of the cigar is medium to full body. The tobacco is the dominant flavor, combined with some spices on the finish. There is also a constant earthy tone, with some leather and wood. Overall, the draw and the burn line are amazing and the ash is dark and solid. In the middle third, the cigar is starting to be creamier, with some creamy coffee notes that now offset the spiciness, which is fading in the background. There are still lots of wood and tobacco but we can also detect hints of cacao and hay. The finish is marked with strong leather and tobacco. Overall, the middle of the cigar is still medium to full body, the draw remains amazing, and the band comes off effortless. In the final third, the flavor profile of the cigar remains similar; the dominant flavors are of wood, tobacco, creamy espresso and bitter leather. The spices come back on the draw, as they were in the beginning of the cigar. It is a great third, very enjoyable. The cigar strength remains unchanged at medium to full body. In summary, this is a short smoke that maybe doesn’t look the nicest, but it sure does smoke well. A great little stogie!